Abu Ghosh is a favorite gathering spot for Israelis in search of traditional Arab/Israeli and Lebanese cuisine, as it is ideally located on Route 1, connecting Jerusalem and Tel- Aviv. After a 30 minute drive from either city, exit Route 1 at the Abu Ghosh/En Hemed sign, and follow the main road into town passing a number of it’s excellent restaurants. It is not only its food that makes Abu Ghosh an excellent destination for your trip to Israel, but it is the history of this Arab village, that many Israelis have a soft spot in their hearts. The village of Abu Ghosh was founded about 500 years ago, and today many of the residents stem from some of the original families that settled there. The residents of Abu Ghosh have historically kept very cordial relations with the State of Israel, because during the War Of Independence the villagers helped the nascent Jewish forces keep open the important road between the coast and Jerusalem. Since then, Abu Ghosh has prospered, thanks in part, to the throngs of grateful Israelis that visit the many excellent restaurants in the village, especially on Shabbat. However, long before Abu Ghosh was renowned for its cuisine, pilgrims and other visitors came to its magnificent Crusader era church. To reach the church, turn left from the main road at the brown directional sign, and follow the road until you see on the right a structure hidden behind a high wall with a green entry gate. If the gate is closed, ring its bell and one of the monks will come out to open it for you. Stepping inside, it’s as if you have entered a miniature Garden of Eden, with a lush landscape, manicured lawn, flowers, palm trees and archaeological artifacts. Indeed a highlight of your travel in Israel. A short walk up the path will bring you to the Crusader Church of the Resurrection, and upon entering you will no doubt be overwhelmed by the beautifully restored frescos adorning its walls. 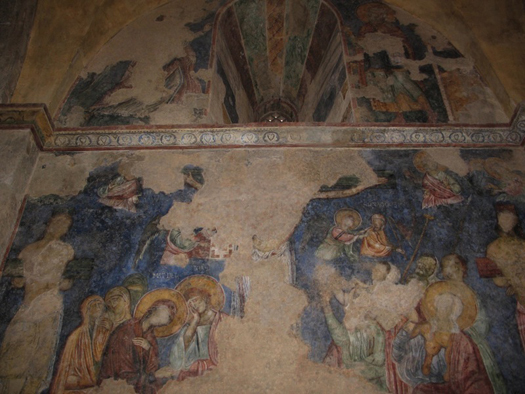 The frescoes were painted between 1150 and 1175, and many have a religious motif such as the Resurrection of Christ, the Dormition of Mary, and The Patriarchs: Abraham, Isaac, and Jacob. The Church is of late Romanesque/early Gothic style, with a triple nave, two sets of arches and a crypt with a spring below which you can also visit. In 1143 the Crusaders identified the site with the village of Emmaus and built the crypt and the church, using as its foundation a Roman reservoir. After falling out of use, the church served as a stable for many years. In 1899 the French government purchased the building, and since 1956 it has belonged to the Lazarists order. Indeed, on your visit you may see monks either inside the church, lecturing to groups of visitors or tending the garden. In the wall of the church, at the entrance, is an inscription reminding the visitor that prior to its construction in 1142, a Roman fort, established for the units of the 10th Legion, occupied the site a thousand years earlier. Visiting hours at the church are Monday, Tuesday, Wednesday, Thursday, Friday, and Saturday from 8:30 to 11:00 and 2:30 to 17:30. You may wish to call ahead at 02-534-2798. A visit to the church would be especially meaningful for any visitor participating in holyland travel. If you are fortunate enough to be visiting Israel during the Succot or Shavuot holidays, you may wish to attend the annual Abu Ghosh music festival at the Crusader Church or at the Notre Dame Arche D’Alliance church on top of the hill just outside the village. The acoustic quality of this church is superb for the liturgical, vocal, and classical music played at the festival, which is one of the best attended attractions in Israel. The church is also a wonderful venue for frequent Saturday concerts. The Notre Dame church was erected in 1924 on the foundations of a much larger Byzantine Basilica, a few of whose archaeological remains can be viewed on the grounds among the ancient olive trees and benches. Tradition has it that the Byzantine Basilica was built on the site of ancient Kyriat Yearim. It is there, that according to Samuel 1, chapter 7, verse 1, that the Ark of the Covenant was placed in the house of Abinadab on the hill after the Philistines decided to return it to the Israelites. The ark remained in Kyriat Yearim until King David had it carried solemnly to Jerusalem in about 1000 B.C.E. 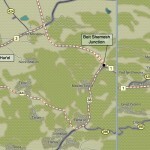 Notre Dame can be reached from the village by following Route 425 toward Tel-Aviv. After passing the old British police station take a sharp right up the hill at the circle. If the imposing iron gate is locked, ring the bell and a Benedictine Nun will open it for you and provide a private tour as well. The hours are the same as the Crusader Church in the village below. Make a point of walking around the grounds for a view of Tel-Aviv in the distance. Of course one can’t depart Abu Ghosh without having a good meal, and there are many excellent restaurants to choose from. Each restaurant has its own story, but the history behind The Abu Ghosh Restaurant, with the blue and white sign on the right side of the main road, is unique. Its owner Jawdat Ibrahim, a native of the village, had moved to the U.S. to make his fortune. Indeed in 1993 he won the $22 million State of Illinois lottery and brought his winnings back to Abu Ghosh, investing them in his restaurant as well as numerous projects to improve the welfare of the villagers. As previously noted, in 1948 the residents of Abu Ghosh chose not to resist Jewish forces in their attempt to keep open the vital corridor to Jerusalem. However, this was not the case of other Arab villages lining the hills of the narrow serpentine road, the “Bab el Wad”, leading to Jerusalem, whose residents viciously attacked Jewish convoys carrying food, medicine and other provisions to the besieged city. Today, the remains of some of these vehicles, known as “sandwich trucks” whose sides consisted of two pieces of armor encasing a thick piece of wood, can be seen on this road ascending to Jerusalem. 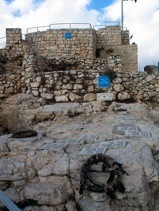 A short distance from Abu Ghosh, the Arab village on the hill known as Castel, was of significant strategic importance to Jewish and Arab forces as it was located on the junction of several routes leading to Jerusalem. The Romans understood the strategic value in controlling Castel and built on its summit a fort, which was subsequently replaced by the Crusader castle Belvoir. Castel National Park can be reached by exiting the Harel-Castel exit from Route 1. After parking your car in the lot, walk around the lower portion of the hill through Rabin Park and along the dioramas to better understand the ease in which vehicles on the road below could be attacked. It was for this reason that a few days prior to the initiation of “Operation Nachshon”, the name given to the Haganah plan to open the road to Jerusalem with a force of 1,500 soldiers, that Castel was captured. The Harel Brigade of the Palmach, led by Yitzhak Rabin, initially took the fortress without resistance, but Arab forces regrouped and a fierce battle lasting five rainy days resulted in the village changing hands several times. On the night of April 7, 1948 the Arab commander el-Husseini, was killed in battle. Intense fighting the following day, led to the retreat of the Jewish forces and the death of 44 of their soldiers. However, once word of their commander’s death reached the ranks of the Arab fighters, they became demoralized and on April 10 abandoned the fortress, returning it into the hands of the Palmach. Today, Castel serves as a national monument attesting to the bravery of the Jewish forces that gave their lives attempting to break the siege of Jerusalem and a stop there should be an integral part of your Israel tour. The names of these soldiers are enshrined at the tower on the summit of the hill, where one can also explore the bunkers and system of trenches that were dug out of rock by hand. On the summit you can also study a topographical map of the area to better understand the hill’s strategic value. Unfortunately, the capture of Castel provided only a temporary reprieve as the road soon again became impassible. Consequently, an imaginative scheme was developed to circumvent the road attacks by Arab villagers. Under the guidance of Michael Stone, an American Colonel with the nom de guerre of Micky Marcus, and unbeknownst to the Arabs, a 12 kilometer bypass road was virtually carved out by hand in a matter of days through the hills and fields leading toward Jerusalem. Volunteers carrying supplies in backpacks would transverse this “Burma Road” to trucks waiting on the other side of the hills to bring provisions to the city’s besieged residents. 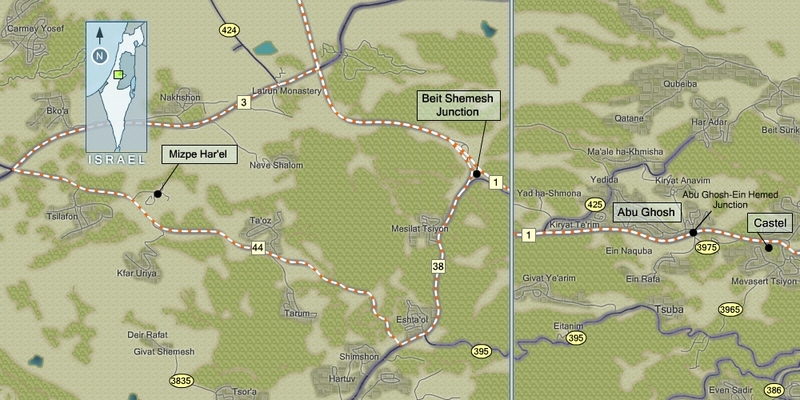 Today one can visit portions of the Burma Road at Mizpe Harel. From Route 1, exit at the sign directing you to Bet Shemesh. Follow Route 38 until it intersects with Route 44. Turn right and follow Route 44 until the entrance to the park, proceeding through an evergreen forest toward a watchtower on a hill. There you will find a large sand relief map, similar to those used by the Palmach, clearly depicting the numerous segments of the Burma Road. Descend the hill by car, stopping along the way to view the pictures of the volunteers who excavated the hillsides to create the new access road. You can then follow this road for several kilometers until you reach other metal cutouts marking the entry point to another portion of the Burma Road. At that point the road becomes difficult for vehicles other than 4x4s, and it is best to retrace your route back to the entrance of the park. Travel to Israel is relatively easy, so from the park travel west to Route 3 and turn right toward the Jerusalem Tel-Aviv highway.